Tonight I went to hear Derek Hutchinson weave a tale about his epic crossing of the North sea, an ocean passage between the British isles and Belgium. His talk was presented at Ocean River, and like a lot of the talks I've had the pleasure of seeing there, this was a top notch bit of storytelling. A bit of background here. 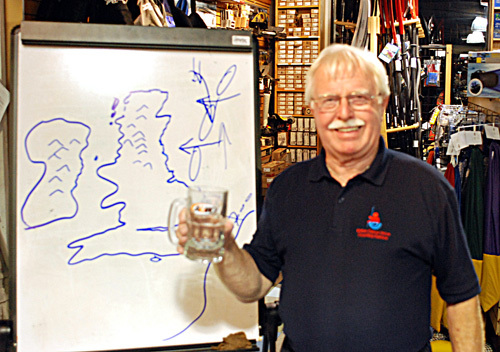 For a bit of background, Derek Hutchinson is one of those legendary kayaking types, credited with creating one of the first bulkheaded kayaks, crossing the north sea and getting a Guinness record and being one of the top ranking BCU members. Derek's story was about a sort of ill planned mission to cross the north sea at it's narrowest point: 100 miles. "100 miles," he said, "4 miles per hour, 100 miles, it'll take 25 hours to cross." Back then, this was not a great idea. No high-tech immersion gear, not enough food or water, no way to sleep in the boat. Needless to say, the first time they did this mission, they didn't make it and got rather sick. They ended up being rescued 8 miles off their destination by a large passenger ship. They were near delirious when they were rescued, and as the boat pulled up along side them, they could hear a megaphone from the deck calling out what sounded like gibberish. "Oh no, it's another language! 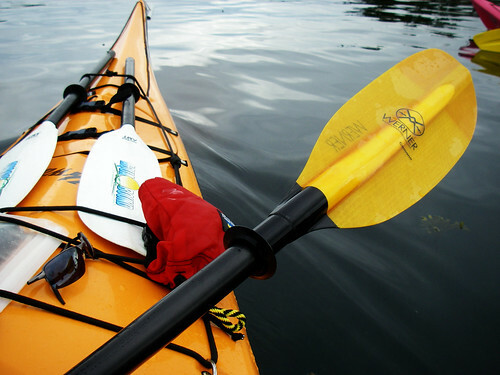 ", he told the other kayakers in his group, "Does anyone aboard speak english?" he asked. Then it dawned on them that the vessel was a ferry between England and Belgium and everyone understood them just fine, " I speak english, so do I," then the megaphone, "r rroo." It was the second trip a year later that was met with much more success. 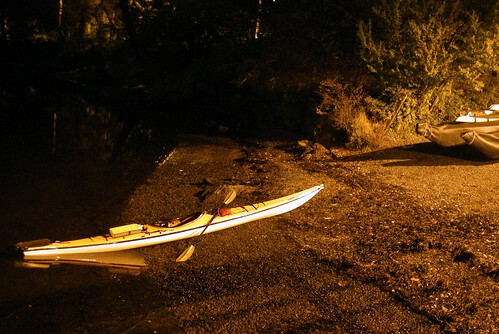 This time, they realized why they were pushing right near 34 hours of paddling the first time around. the currents whip through the shallows just off the coast of Belgium and they made little progress during a flood tide. The group paddled hard to a giant buoy and then waited out the tremendous current by hooking their tow lines to the buoy. Once the tide changed they whisked right to their destination and realized they had accomplished one of the longest marathon paddles in history. Recently, Hutchinson's boat was added to the British maritime museum right near Shackleton's boat. It was great hearing a kayaking legend just talking about his great tours in humorous retrospect. Next time I might consider going out for some lessons with him. Today was one of those few special days where the current and wind all line up to produce perfectly flat water in normally noisy passages. We started out with the plan of going out to Chatham and discovery to give John and Louise's boats a try in the swell and current, but there wasn't much going on, so the plan evolved into going to the chains and then onward to Gonzales point, or "The Grand Tour." I'm paddling with a shiny new Werner paddle. After being blown away by the feel of it at Paddlefest in May, I finally stashed enough away in my kayaking budget to buy it. It's a Werner Camano with a 230cm straight shaft. For my paddling style, it was the best on the beach out of about 20 I tested that afternoon. I walked into Ocean River and found it right on the shelf... no ordering necessary. My Aquabound AMT, also a great paddle, is now my backup instead of a $30 canadian tire shovel paddle. 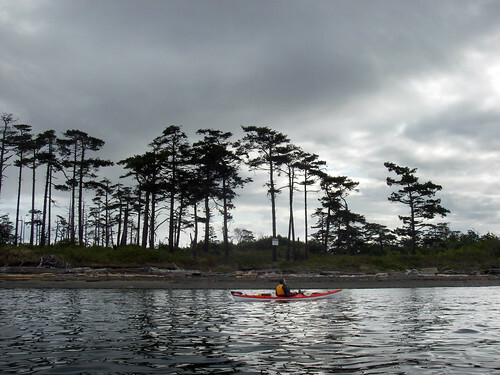 We left from Cadboro Bay at our usual time and had a pretty swift paddle out of the bay and out to Jemmy Jones. The water off Jemmy Jones was laughably flat, so we went right out to Chatham where John started giggling. he remembered a time when ending up out here was nearly unthinkable in their 10 foot rec boats. 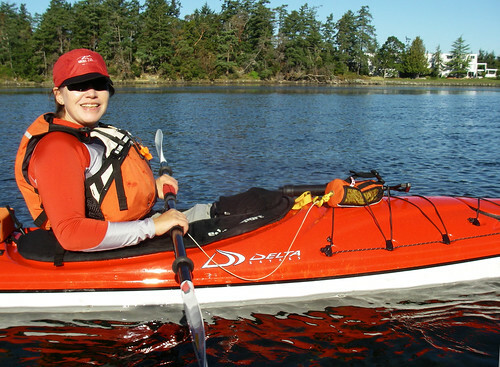 The whole group now has totally suitable sea kayaks and we were out to the shores of Discovery in under 45 minutes. Suddenly, the air was ripe with the smell of fish heads, and it was this point where we decided to go to the Chains. 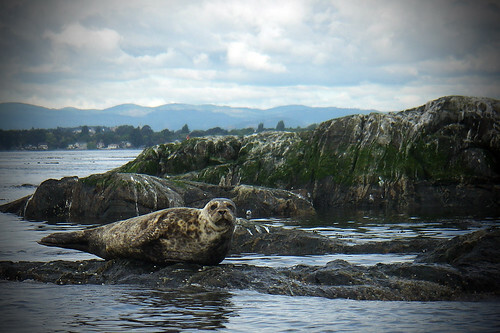 Seals kept popping up throughout the day, but the chain islands had a particularly massive density of them. John and I had a field day trying to get some photos. The rocks at the end of summer are covered in a thick layer of bird droppings, which Paula gave the name, "used fish." The water was still dead calm. We all left the chains and started toward shore. 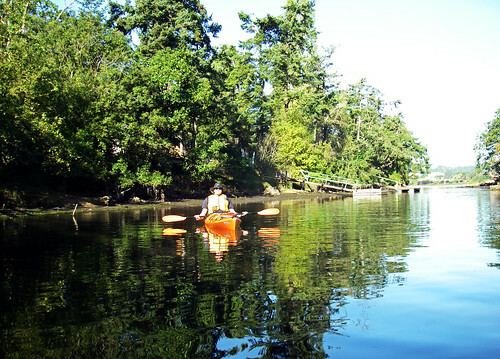 I felt trial island calling my name on our way across to oak bay - maybe another time I'll tackle that too - make it a really grand tour. I couldn't convince the group to follow me out to trial, so I hung with them and we found a patch of slightly wavier water near Gonzales point. Here was a place where they could put those new Deltas to work. Everyone made it across the swells at the transition of Juan de Fuca and Haro and so we went right down to Gonzales point for a little looksee. As we got to the rocks at the point, the current really picked up. There were some short period, choppy waves due to a different wind pattern blowing through JDF. I immediately went out to play in them and found the rest of the group were out there too! This is really heartwarming, actually. It's nice to not be the only one enjoying the waves and I think the bigger boats have helped their confidence with slightly noisier conditions. As we came back in from the point, we were all back awake. We had to fight the current back up the coast as we were getting to the midway point of the ebb, but the wind was at our backs. 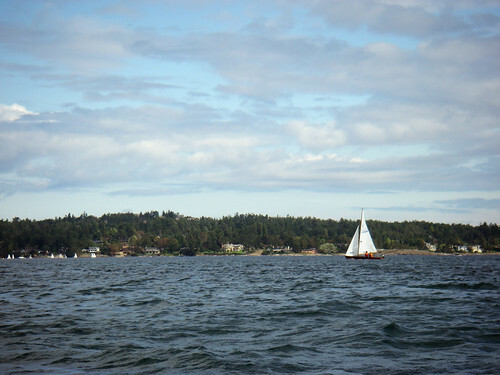 The Sunday afternoon boaters were catch a pretty good fair-weather wind. 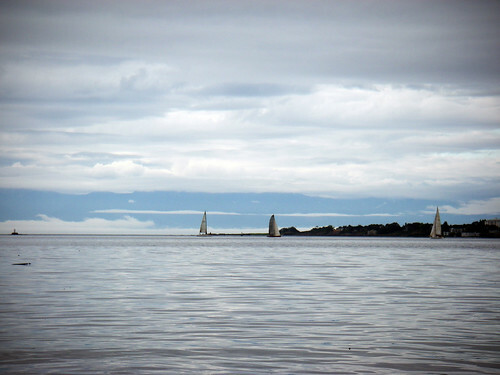 Tons of sailboats and tiny dinghies were skimming right near shore, so we had to make sure to stay close together. As the paddle came to a close, I really started to appreciate the new paddle. Not being sore in the shoulders after paddling is a welcome change. 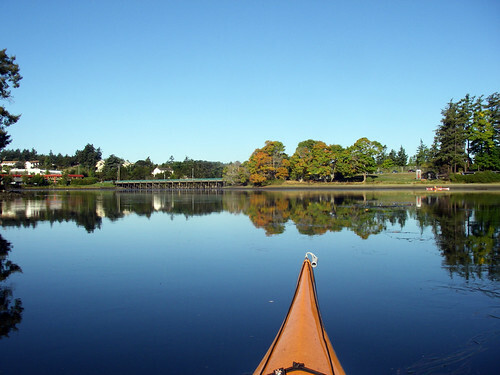 I'm going to try to make a weekday paddle this week and then the big gear up at Ocean River is next Saturday! It's appeared on the blogs over the last day or two that National geographic is running a documentary called Solo: Lost at Sea that follows the late Andrew McAuley through his fatal trip in the Tasman. I've heard all the stories through the net, but even the trailer for this documentary hits you like a ton of bricks. Here's a link to the national geographic site, have a look - not for the faint of heart. If you like a certain trip, why not try it again? I really did enjoy my night's paddle on Friday, so I asked one of my friends that joined me at Vermilion lakes if he'd like to come out to the gorge and have a little paddle around portage inlet during the morning. I had a look at the tides and decided 8am would be a good bet, but the ebb and flow under he bridge is always a dicey call. Today I guessed utterly wrong. 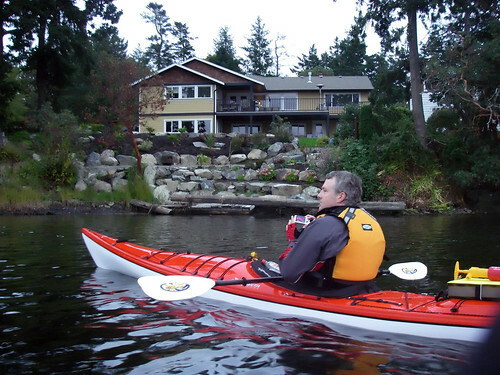 My friend rented from Gorge rowing and paddling center at on the Selkirk waterfront. I brought the Telkwa and put in on the little harbor ferry dock. Today was just great outside. Lots of shorebirds even down at this end of the gorge. The only little thing is that I could see a pretty good current running past the trestle and feared what was going on under the Tillicum bridge. 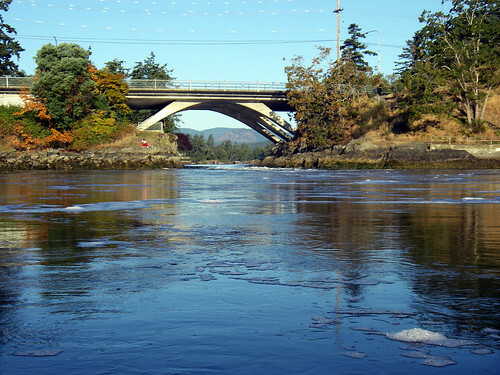 We paddled up the inlet a ways and saw whitewater at the east side of the bridge. So this was a bit of predicament, but it really isn't all that far of a walk to the other side of the bridge, so we took out and portaged up over Tillicum road and then down to the clubhouse in a couple of trips. We didn't make too bad of time and put in among the geese and lazy water on the other side of the bridge. The tide was pretty far out, so the area was fairly shallow with huge patches of eelgrass. the Canada Geese were feeding off of it somehow. Their honking noises filled the air as we got a bit too close. 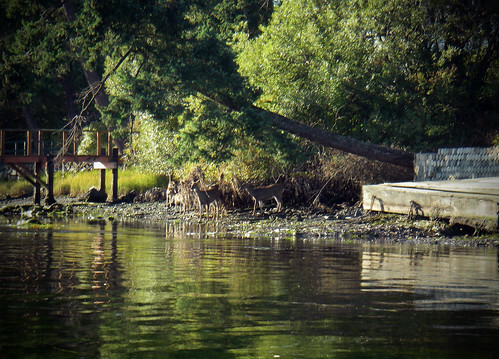 It wasn't too far from the geese where we saw a whole family of deer coming down to the shoreline. They walked along the beach aimlessly - not exactly sure what they were after. The water was getting pretty shallow through the gorge park and our speed was way down because of the current rolling over the shallows. 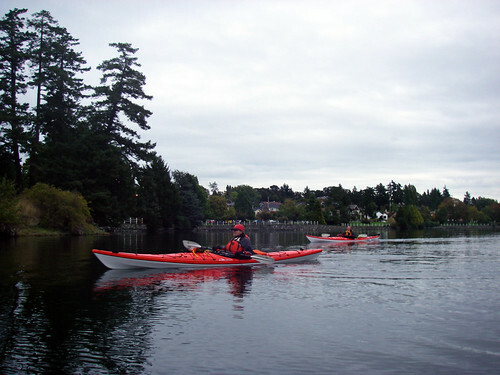 At the end of Gorge Rd, we met up with the folks from kayak yak - a totally unexpected meeting. John and Louise have new boats! They both got new deltas in red and white. John got an 18'5" and Louise is now the owner of an ocean dominating 17' delta. Now they have to follow me into the waves and noisy water. Jordan and I broke off from the group and headed out the way I went the other night, while the other group went to look for life in the shallows. The place feels a little smaller in broad daylight, but we headed over to the stream and went up as far as time allowed. This is always the hard part about renting, you kind of have to rush to get all the objectives. I've found a couple of places that I wouldn't mind owning along the waterfront - I think it was nearly every single house. Time was up so we headed back in a swift following tide. The eelgrass made for a bit of slow going in a lot of places. We thought there was a small difference in speed in a few areas, and it turns out that there are a number of back eddies that swirl through the main gorge area. As we got down near the bridge again, we decided to take the challenge of going down it during its whitewater phase. It goes about a hundred directions with tons of little whirlpools, but overall a fun roller coaster ride. At low tide you can see the waterfall height difference. It was only a matter of minutes and we were back at the trestle with a little time to spare. We pulled out and headed to a great little greasy spoon restaurant called Kitty's between Douglas and Burnside. A fun paddle and well done by my friend, who racked up 11km plus a portage! It's been a busy few weeks at work, and I'm pleased to be back on the water after work. 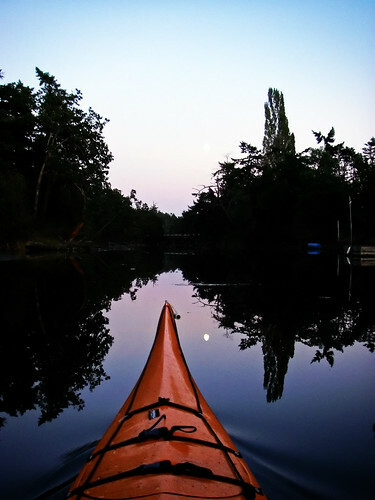 This night was a surprising beautiful night paddle through the portage inlet and up the stream on the east side of the inlet. 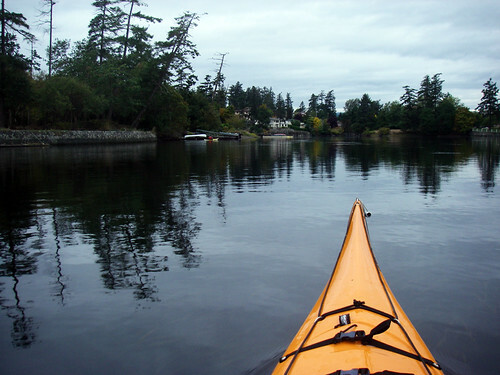 I put in at the kayak club on Gorge Rd. So I got the put in and realized I forgot my paddling boots. woops.. I won't do that again. I had also left the boat on the cartop and left the car under a tree.. all manners of pollen, sap and wood bugs were all over my boat and it was full of rainwater. I didn't let that get to me, I just got in the boat and pushed off into a nice quiet and warm evening. 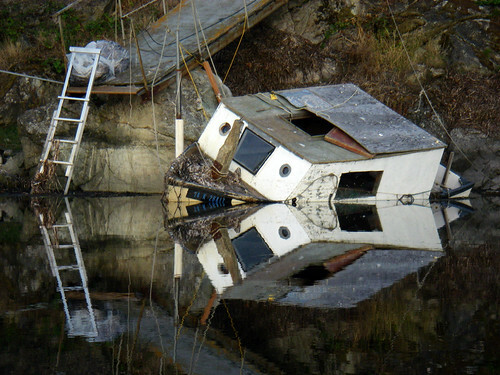 Almost every house along the gorge has some manner of dock down on the water in various levels of disrepair. The most notable was a dock that led to a half sunken boat. The water was an absolute mirror without a puff of wind, so the scene was begging for a photo. Seaweed, eelgrass and all kinds of other flotsam loves to inhabit this rather current-less area too. I didn't see any eggs that my friends at kayak yak had seen in the previous trips up here, but I was out at high tide, so I don't think I had ideal conditions for it. 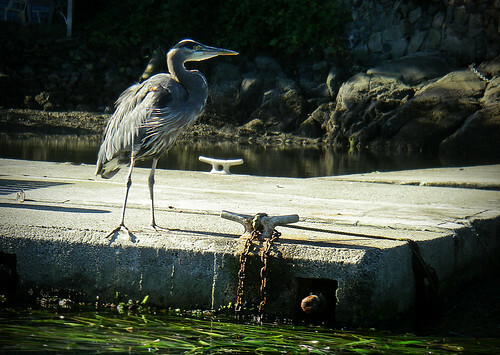 As I entered portage inlet, A heron flew off and made me focus on the sky. 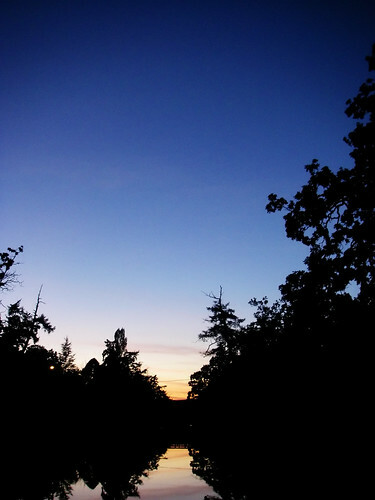 This HUGE moon was just rising over the trees and the residents of the area were lighting candles and small porch lights on their deck for entertaining. The place was alive with disembodied chatter from shore and the sky was turning all sorts of yellow and orange. I started my way to the western side of the inlet and saw a few other kayakers enjoying the night. I saw the little stream and started my way along it. The sounds of traffic got fairly hushed and the watter got a whole lot shallower. The scenery was still stunning. The moon hung above craggy trees and some more run down properties. 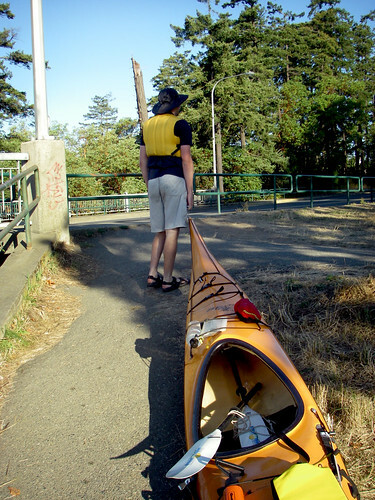 There were a number of canoes and old powerboats on the shore and before I knew it, I was passing under the bridge on interurban road. This stream eventually winds out to swan and beaver lakes. I'll have to pick a really high tide and high water and see how far I can get up the stream. It was getting dark and the trees along the shore were making it even darker, so I decided to spin around and head back to the inlet. 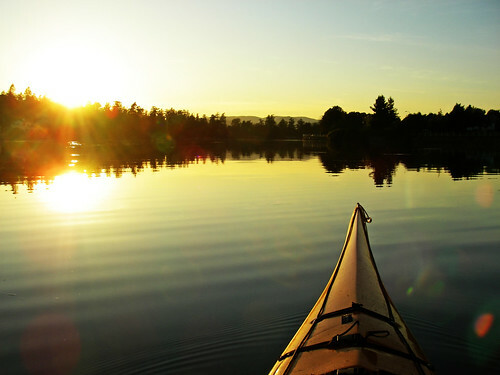 The mosquitoes were out in force and I had to keep paddling to keep them at bay. 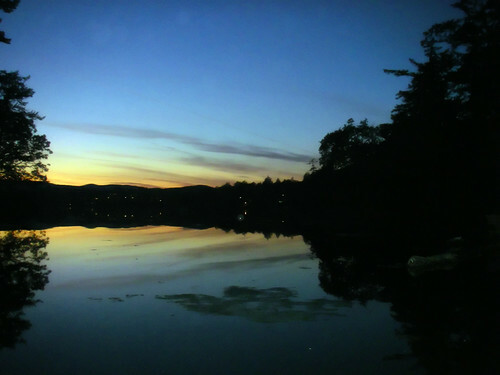 The inlet was silent now and dusk was in the blue period. 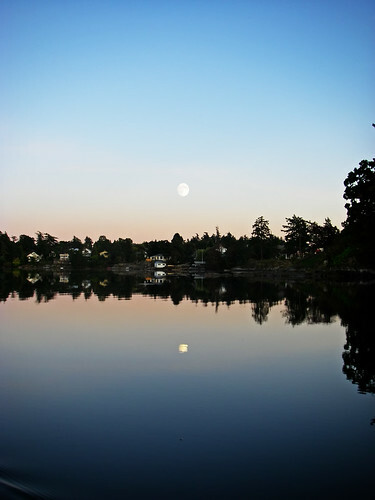 The near full moon was reflecting brilliantly on the water. 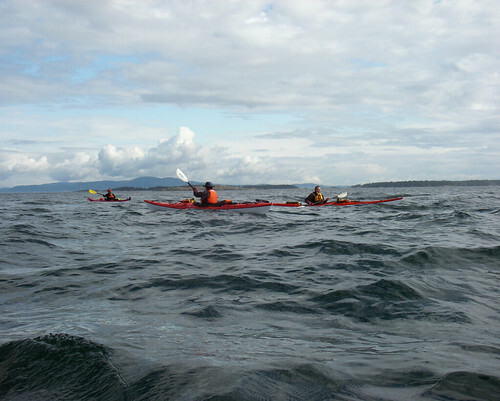 I met two other kayakers doing a hot lap of the inlet. They invited me to join their "ballet" on the water. I sort of thought of it more as the ewok village on endor, but hey.. everyone has their own imagery to relate to. The little flickering lights and candles on the shoreline made this almost purely visual crack. I swiftly paddled back down the gorge and gouged my feet on the beach taking the boat out of the water. I think my little kayak needs a serious bath soon.